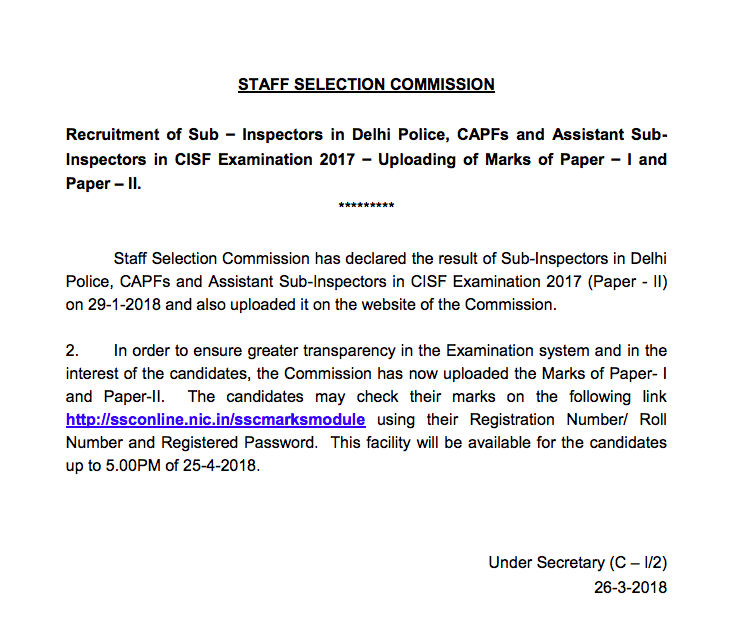 Staff Selection Commission has declared the result of Sub-Inspectors in Delhi Police, CAPFs and Assistant Sub-Inspectors in CISF Examination 2017 (Paper - II) on 29-1-2018 and also uploaded it on the website of the Commission. In order to ensure greater transparency in the Examination system and in the interest of the candidates, the Commission has now uploaded the Marks of Paper- I and Paper-II. The candidates may check their marks on the following link http://ssconline.nic.in/sscmarksmodule using their Registration Number/ Roll Number and Registered Password. Candidates can check their score card up to 5.00PM of 25-4-2018 after that link will disable.